PDB, like the official page says, it's an interactive source code debugger for Python programs, and IPDB is a tool that works over PDB that brings features like tab completion, syntax highlighting, better tracebacks. print "What I'm I doing"
This will also work in frameworks like Flask and Django. Print the list of available commands. You can also pass a command as an argument, it will print the help about that command. Move the current frame one level down in the stack trace. Move the current frame one level up in the stack trace. Execute the instruction, if the current instruction is a call to a function, it will call the first instruction of the function, and so on. Very similar to step, but if the current instruction to execute is a method, it will execute it without going inside of it. It will Continue execution until the current function returns. It will set a break given a current line number as an argument, also the line number may be prefixed with a filename and a colon, to specify a breakpoint in another file. List source code for the current file. Without arguments, list 11 lines around the current line or continue the previous listing. While with one argument, will list 11 lines around the specified line number, and with two arguments, list the given range. Print the argument list and their values of the current function. Evaluate the expression in the current context and print its value. Similar as print. The program or code being executed is aborted. PuDB is a tool very similar to pdb, actually you can even do exactly the same with both, the difference is that PuDB comes with a GUI, which could simplify things for you. The usage is pretty much like pdb, you just have to install via pip. Once you have it installed, you just have to call set_trace in your code. As you can see in the image above, the variables, stacks and breakpoints automatically changes while you are executing your code, you can also visualize the breakpoints in the left panel, which it could be useful. I personally didn't like the default theme, but the good thing is that you can choose over 3 other themes, you can even create your own theme. The user interface is pretty easy to use. Popup with all the available commands. It Swaps you between the terminal and the panel. Moves you up and down in the code panel. Both PuDB and IPDB works in python and anything that runs python. 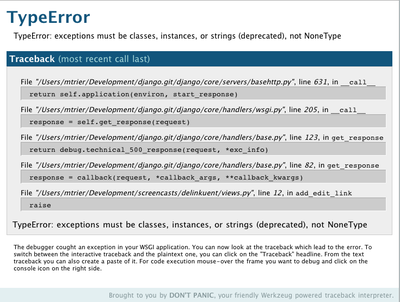 A Django traceback page with benefits. 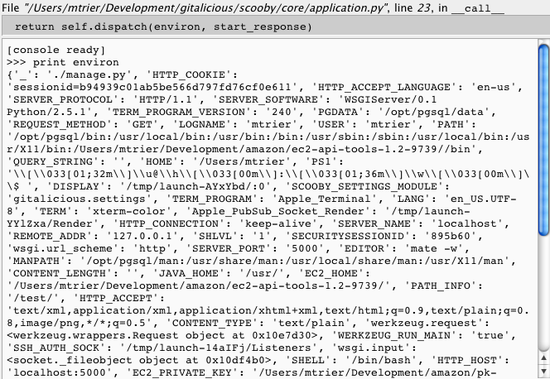 Provides a nice access view to the source code. The insteresting part of the last option, is that you could check the context in any particular line, which I believe is awesome!. Last but not least this amazing tool, will save you a lot of time. Not only works for debugging, but also, will help you optimize your code, specially with those tedious queries!. 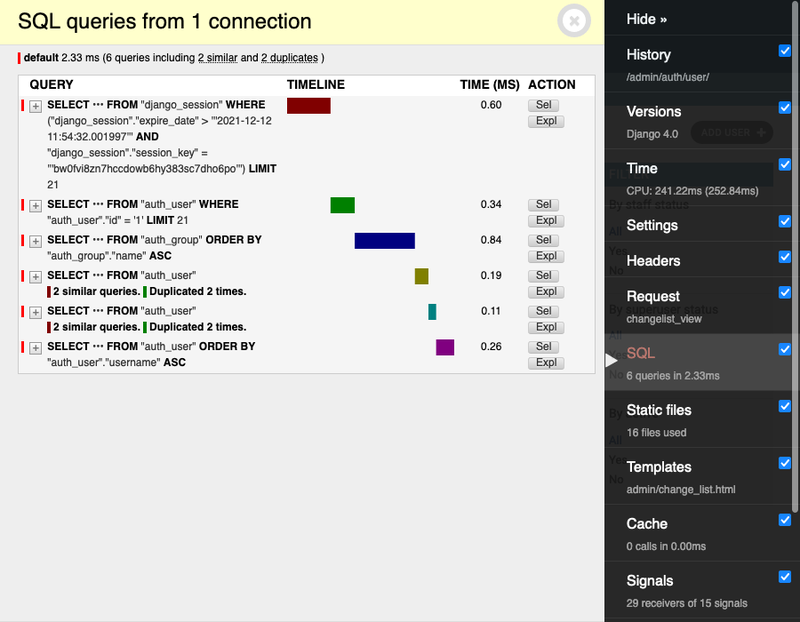 Django Debug Toolbar as the official page says is a configurable set of panels that display various debug information about the current request/response, and one of the main feaures is the capability to show you the queries after every request. Even though sometimes it's "easier" to use flags as a debugging option, it's not always the best way to solve problems. These tools are meant to be used, and they will help you most of the times to solve issues quicker than without them, so give them a chance, you might like them. Posted on Jan. 3, 2015, 9:59 p.m.